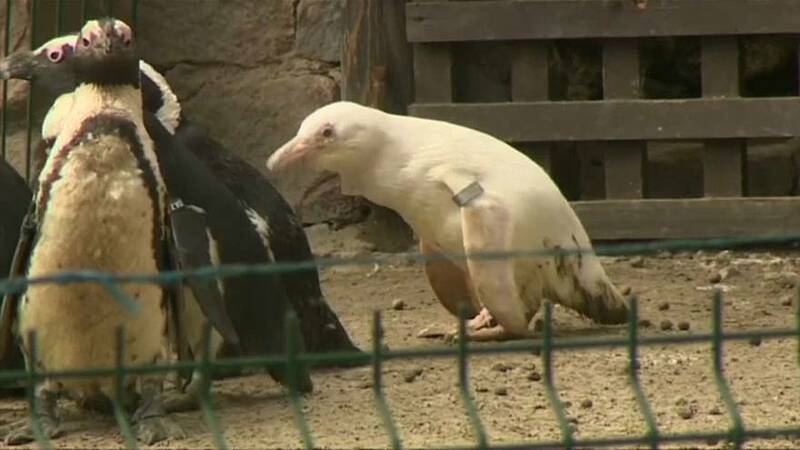 The world's only albino penguin raised in captivity has made its first public appearance, at Gdansk Zoo on Friday. The bird, whose gender is unknown and who has not so far been named, tentatively stepped out of its shelter, sticking close to other members of its flock. The zoo's penguin keeper Tomasz Fiolkowski said: "My colleague was checking to see if a chick had hatched, and it turned out to be a white chick. We all couldn't believe it, so we went to have a look and there really was a white chick. We were really astonished and were incredibly happy." However, zoo staff say that despite being a hit with keepers thanks to its unusual plumage, the penguin would stand out for all the wrong reasons in the wild. The bird would be the first to be attacked by predators and could be rejected by the rest of the flock. After hatching the bird was kept apart from the rest of the flock for its safety. Zoo director Michal Targowski said: "To put it bluntly, it's a misfit. The white colour really catches your eye. It would be the first to be attacked by predators. "Furthermore, all albinos are genetically more prone to diseases. The pigmentation which is responsible for the colour of a penguin's skin and feathers also serves as a protective barrier. "It's important to really keep an eye on it to protect it from possible mishaps. Also, there is a danger that the flock won't accept it. Right now it is being guarded by four adult birds – two older ones which are very calm in temperament, and its parents. This guarantees peace [in the flock]. "It spends its nights inside its stone den because that is where it was hatched and raised and it's where it feels safest." Albinism is a congenital disorder causing total or partial lack of pigment that results in white hair, feathers and fur and pink eyes in people and animals. The first albino penguin to be born in captivity is believed to have been a bird called Snowdrop, born in Bristol Zoo in 2002. Snowdrop died less than two years later, according to British media.